For the first time in Cincinnati USA American Marketing Association’s history one company wins two awards; Flottman Company wins the 2013 Small Business Marketer of the Year and Flottman’s Director of Marketing & Communications, Ed McMasters, wins the Individual Marketer of the Year Award. “It is an honor to be recognized by Cincinnati’s marketing experts, the American Marketing Association,” stated Sue Flottman Steller, President, Flottman Company. 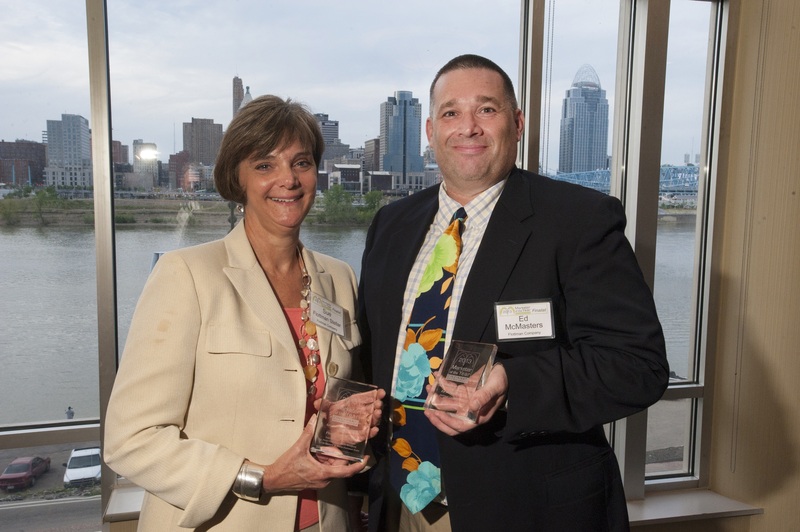 Northern Kentucky (PRWEB) May 10, 2013 -- Flottman Company claimed two Marketer of the Year Awards from the American Marketing Association. The Marketer of the Year Awards were handed out last Thursday evening (May 2, 2013) at the Embassy Suites, RiverCenter Banquet Hall. Flottman Company entered the event as one of two finalists for the 2012 Small Business Marketer of the Year and Ed McMasters was one of three finalists for 2012 Marketing Department of One. For the first time in American Marketing Association history the same company wins both awards. This marks the 6th Annual Cincinnati AMA Marketer of the Year Awards which seek to honor “exceptional marketing efforts” by Cincinnati-area individuals, companies and organization. These awards salute the importance of marketing in driving our economy. The winning marketers have exhibited results, creativity and overall achievement of strategic marketing objectives. 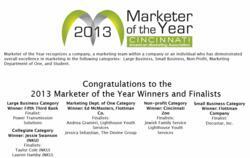 “Thank you, what an honor to be recognized for our efforts by Cincinnati’s marketing experts. Over the past few years our Marketing Department has strengthened the way we present ourselves as a definitive strategic marketing solutions provider – the growing awareness of our marketing abilities is evident through the growth of our website traffic, social media profiles, media placements, sales and partnership opportunities,” stated Sue Flottman Steller, President, Flottman Company. The Small Business Marketer of the Year Award was awarded for the Flottman’s WOW Campaign. In an effort to promote Flottman Company’s capabilities in Marketing Solutions, Miniature Folding and Printing Expertise; a multi-channel marketing campaign was launched to elevate the Flottman Company Brand. Results included over 226 story placements through 82 different media outlets for a total of 16,622,248 total media impressions, translating to over $8.3 million in total publicity value. The campaign, completed under budget, included full-page print ads, trade show targeting and a multi-channel media focus with direct mail, email, social media and web placement. Year-over-year sales increased nearly 20% and set new company sales high. Ed McMasters, Director of Marketing & Communications received the American Marketing Association’s First Annual Marketing Department of One Award. McMasters received the award with his New York Times Media Campaign. McMasters was able to parley a print media opportunity in The New York Times into print placements in the Wall Street Journal, Print Solutions magazine, Family Business magazine, the Cincinnati Enquirer and the Business Courier. In addition, Tom Flottman and the Flottman Company received media placement on WNKU Public Radio, Businesswise on WCPO television and on CNBC’s Small Business Round Table. Flottman and the entire Flottman family were asked to address the Goering Center for Family Business, 2013 Family Business Transitions Expo and McMasters was requested to speak at the 2012 Graph Expo. The marketing recognition increased Flottman’s Facebook likes, Twitter followers, website visits and overall sales. The American Marketing Association honored the Flottman Company along with Fifth Third Bank for Large Business Marketer of the Year, Cincinnati Zoo and Botanical Garden for Non-Profit Marketer of the Year and Marketing Student of the Year from Northern Kentucky University, Jessie Swanson.